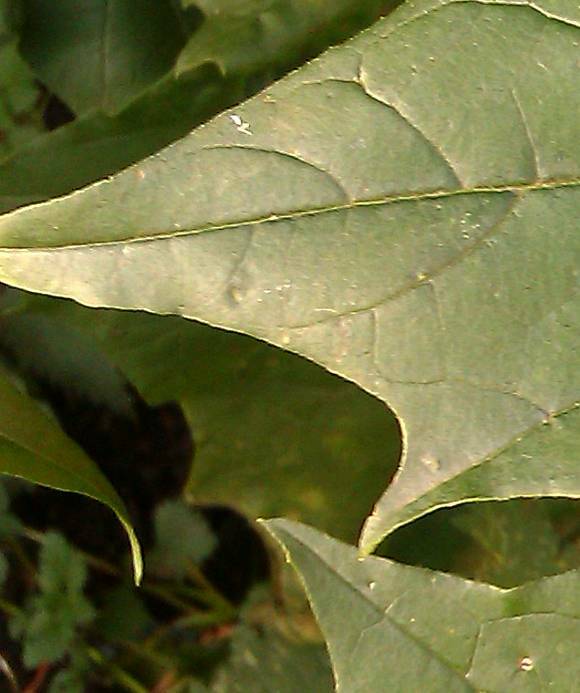 Leaves mid-green and irregularly toothed. Known for the thorns on the fruit, which do not in any way resemble apples but more like those of Sweet Chestnut. Leaves hairless and with distinctive long, pointed and curled teeth which echo those of the petals. The flowers are white, trumpet-shaped with five very-pointed petals. The petals are wrapped like a half-un-folded umbrella, with a 5-lead spiral appearance. The sepal tube it emerges from is pale-green, square-ish in cross-section and long. 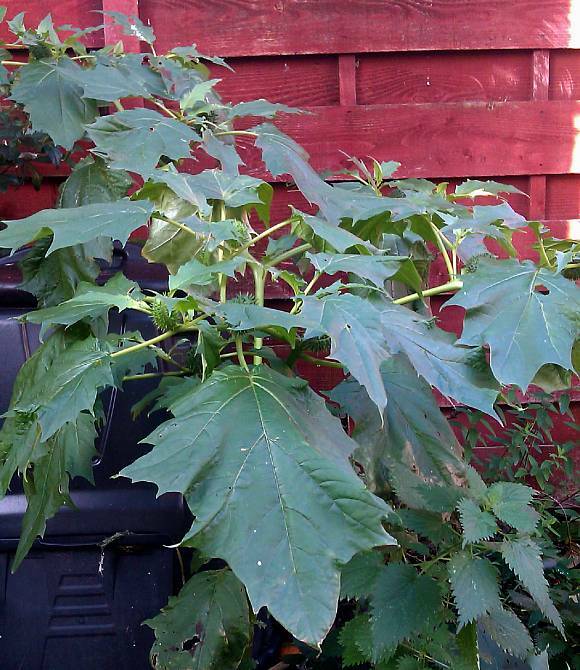 Leaves large, satin and dull-green with irregular jagged teeth. 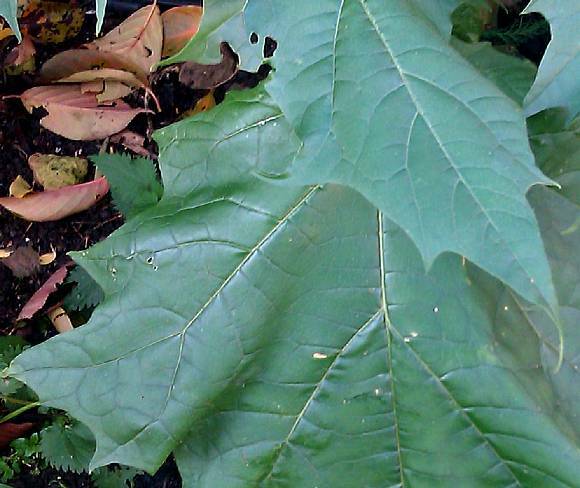 The leaves lack the black dots and black trichomes of those of Apple-of-Peru. Leaves have appressed shortish hairs. The fruits are ovaloid, have a great many sharply pointed narrow thorns and with a circumferential depressions where it splits open along four rift lines like peeling a banana. Ripe ones are large, from 3 to 7cm across. The stems have very short fine hairs. Stems trifurcate with side branches diverging in opposing pairs at a characteristic slightly forward angle. The seeds are numerous, black, kidney-shaped and small, contained in 3 compartments within the casing. 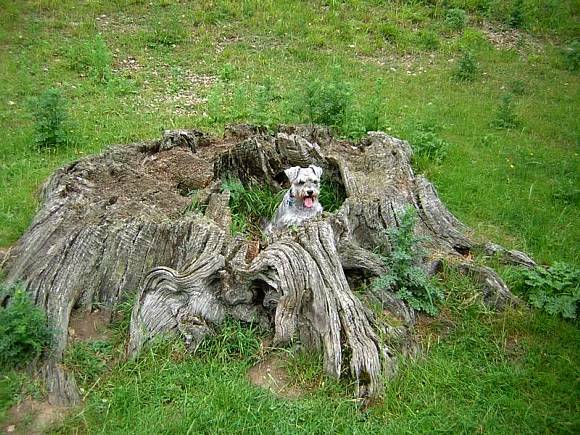 Claire Sykes's Dog in a pose which made your Author smile and deserving of a larger portrait here. Easily mistaken for : Longspine Thorn-Apple ( Datura ferox ) which is in the same genus but has more robust and longer spines on the fruit. Other size differences are also apparent: smaller calyx 2.5-4cm (3-5cm for Thorn-apple), shorter calyx teeth 3 - 5mm (4-10mm for Thorn-apple, smaller corolla 4-6cm (5-10cm for Thorn-apple), larger fruit capsule 5-8mm including spines (3-7mm for Thorn-apple), longer spines stout 10-30mm long (slender and 2-15mm for Thorn-apple and spineless in var. inermis). Longspine Thorn-apple also has some spines with a very broad base and longer than 20mm. Some similarities to : the Bindweeds (Convolvulaceae) such as Hedge Bindweed, Large Bindweed and Field Bindweed in that the flowers have some similarities, but the leaves and stance totally different (bindweeds climb, Thorn-apple doesn't). Slight resemblance to : Apple-of-Peru (Nicandra physalodes) but that has pale blue-white trumpet-shaped flowers and less to Cape Gooseberry (Physalis peruviana) but that has a much shorter trumpet which is pale yellow in colour. Grows in waste places, as an arable weed, or in gardens, preferring a calcareous soil. Nitrogen fertilisers will increase the proportions of tropane alkaloids produced within the plant. 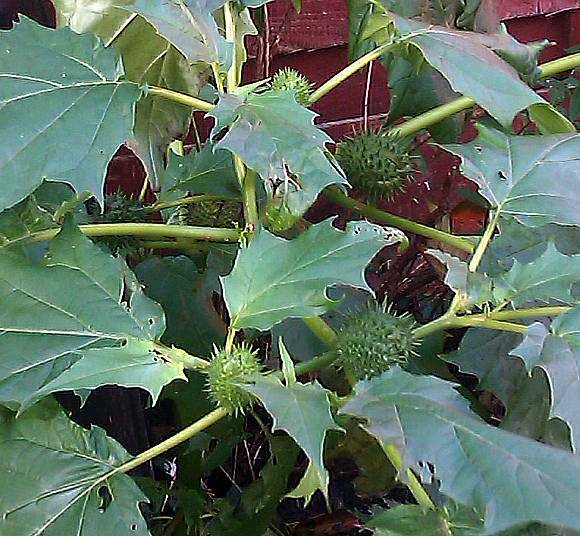 It is native to North America, where it is known as Jimson Weed. Flowers and leaves of a similar shape to those of Apple-of-Peru, but rather than being light blue and with a white inner, the flowers are greeny-white with a greenish inner. The leaves lack the black glandular trichomes and the black, five-flanged flower buds of present on Apple-of-Peru. 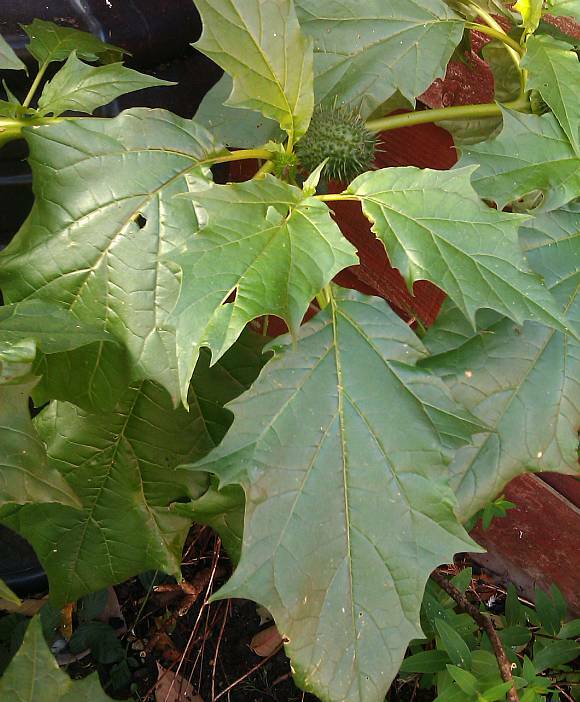 It is also in a different Genus (Datura) than that of Apple-of-Peru (Nicandra), although it is in the same Nightshade Family. It possesses much the same Tropane Alkaloids as does Henbane, such as Hyoscamine, Scopolamine and Atropine but not necessarily in the same proportions, nor indeed in the same concentration. 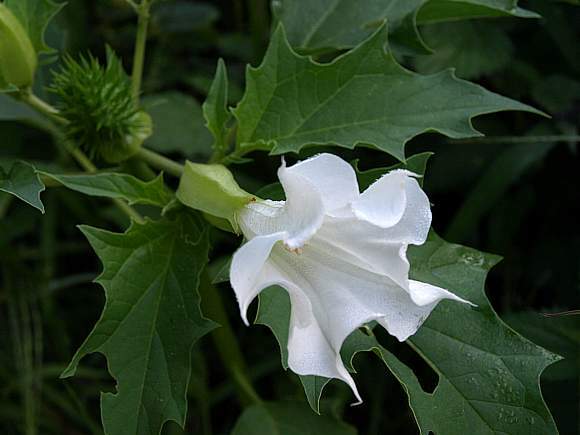 Indeed, the Datura Genus is renown for the highly variable concentrations of these alkaloids, varying in concentration by up to 5:1 depending upon soil conditions, growing site, the climate, the weather and a host of other variable ill-defined factors. See Henbane for a description of the Tropane Alkaloids (present to variable degrees) in Thorn-Apple. Atropine has been in use medicinally for treating asthma attacks for many years. It causes paralysis of the pulmonary branches of the lungs thus preventing the abnormal contraction of the bronchioles which restricts the amount of air the sufferer can breath during an attack. 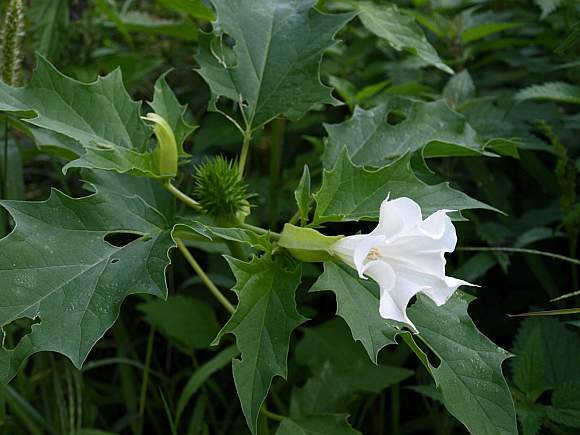 Those with heart conditions should avoid this medicine based on Datura extracts, which can also precipitate hallucinations which persists for several days. However, the therapeutic range is very small, a slight overdose often results in hospitalizations or even death. 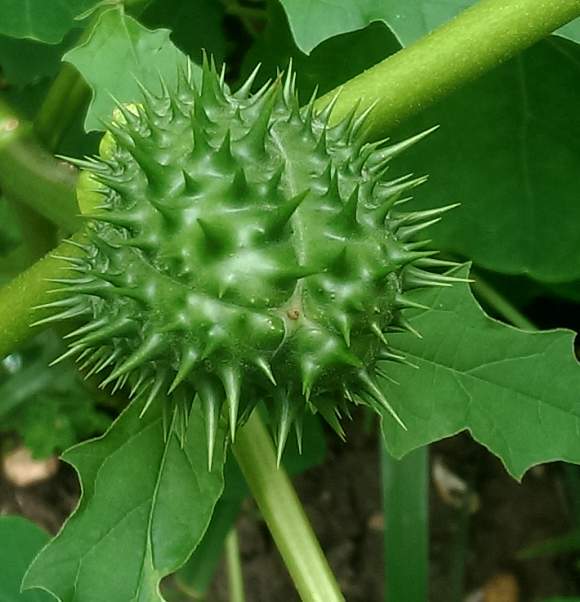 Thorn-Apple is highly toxic.